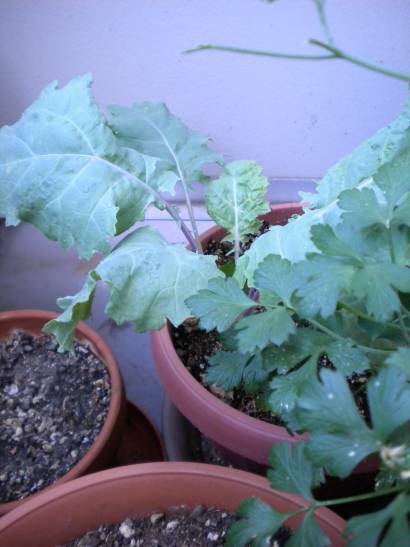 This spring I grew a bundle of kale plants on our window sill and planted them in the garden. Various bits of nature (aphids, cabbage worms, and my own learning curve) conspired to bring about their early demise. These things also taught me in concert that kale might be better as a winter crop, and so I'm plotting to plant some with the mizuna, komatsuna, and other winter greens I'll put in once this heat wave breaks. That said, a seedling or two never made it to the garden. I ran out of room there, and had two that still needed a home. Essentially nonexistent here except for the ornamental variety, I couldn't bear the thought of throwing these precious seedlings away. So, I potted them up. One went in with my morning glory vines, and the other got a pot of its own. The seedling at the base of the morning glory vines did alright until the heat started in earnest. Not even regular watering paired with the smattering of shade provided by the vines could keep it going. However, the seedling planted in a pot of its own found a better fate. Knowing it would despise the intense heat characteristic of our western facing balcony in the afternoon, I put the pot in a slightly shady corner. Tucked behind a larger container holding bergamont, parsley, and tsuru murasaki it spent a fairly peaceful summer. An aphid attack early on robbed it of almost all the leaves, but as the heat and sunshine increased the aphids decreased and finally disappeared. While it hasn't grown exponentially, it has grown well and I'm pleased as punch to see it with me still.